*Received through Simon & Schuster's Galley Grab program. I'm currently a jumble of thoughts and the most prominent one is... wow. When Clara leaves her old life behind, it's to escape Christian--who is quite literally crazy about Clara. He calls her, texts her, and e-mails her too. Finally, her father decides that enough is enough and along with Clara they escape their old life and start anew at a seaside town. There, she meets Finn who is the opposite of Christian. He's confident and she doesn't have to worry about what not to say around him. Things take a turn when Christian contacts Clara again and she'll be forced to confront him one last time. Where do I begin? Most of the time, I loved Clara's character and I felt like I could identify with her--not due to Christian, but due to her shy nature. However, there were times in which she annoyed me (namely when she gave in to Christian and tried not to "hurt his feelings"). Christian and Finn were as different as night and day and to be honest, I loved watching Clara and Finn's relationship evolve. Then, on a minor note, there was Chloe (Finn's sister) whom I loved as well as her seagull stalker. Yes, you heard me right, she has a seagull that follows her to work and home again--whom she named Gulliver. 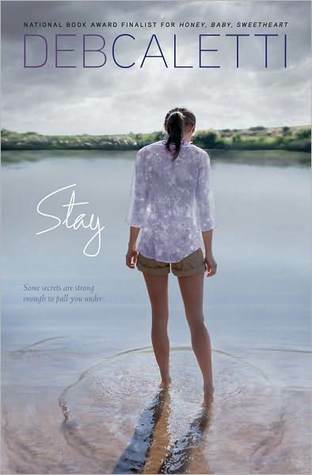 Deb Caletti has done a wonderful job with Clara's voice and she's created a great cast of characters in Stay. If contemporary (YA) romance is your particular cup of tea--or if the plot has you intrigued--I'd definitely suggest picking up a copy of Stay to read. I feel like I should mention that although my review focuses on the main plot, it is not the plot in its entirety--however, I feel that I shouldn't give too much away and so I shall say no more than that. With all of that, I'll leave you with a quote that I rather liked--well, the one I liked best, for there were many wonderful lines throughout Stay. "But if fate is a shape-shifter, then love is too. It can be, anyway, in its most dangerous form." yay, I'm so glad that you liked it! I can't get enough of her books and this one was my favourite thus far! Great review! I loved this book so much! I haven't heard of this one before but it does sound good.